Home > Used Vehicles > 2013 Honda Accord Sedan Touring,LEATHER,SUNROOF,NAVIGATION,AIR,TILT,CRUISE,PW,PW, LOCAL TRADE,CLEAN CARPROOF!!!! 2013 Honda Accord Sedan Touring,LEATHER,SUNROOF,NAVIGATION,AIR,TILT,CRUISE,PW,PW, LOCAL TRADE,CLEAN CARPROOF!!!! Navigation, Leather Seats, Blind Spot Assist, Power Memory Seat, Heated Seats! On Sale! Save $1000 on this one, we've marked it down from $19900. 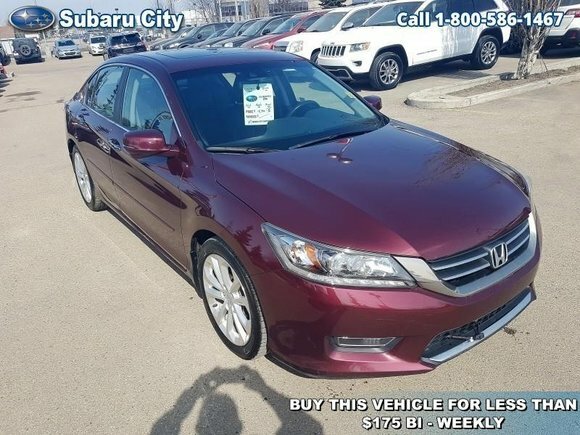 This 2013 Honda Accord Sedan is for sale today in Edmonton. Updated design for the 2013 Honda Accord Sedan provide improved refinement with a quiet cabin and ample space for everyone. This sedan offers impressive performance while still focusing on efficiency. Along with top safety ratings, modern technology provides information and entertainment for all of your journeys. This sedan has 72040 kms. It's basque red pearl in colour. It has an automatic transmission and is powered by a 2.4L I4 16V GDI DOHC engine. This vehicle has been upgraded with the following features: Navigation, Leather Seats, Blind Spot Assist, Power Memory Seat, Heated Seats, Lane Departure Warning, Sunroof. Buy this vehicle now for the lowest bi-weekly payment of $165.80 with $2068 down for 60 months @ 5.99% APR O.A.C. ( taxes included, $790 Administration and Secure Ride included / Total cost of borrowing $2947 ). See dealer for details. Want to try the 2013 Honda Accord Sedan Touring?